Calculators & Evaluators is an interactive suite of online calculators and questionnaires. It is designed to generate fee-earning opportunities through your website. It is the most comprehensive suite available today, with calculators on subjects as diverse as business, law, finance and taxation, and questionnaires on areas such as body language, interpersonal and entrepreneurial skills. In today’s competitive business environment, accountancy firms must do everything they can to stand out from the crowd. Calculators & Evaluators is a true differentiator: it underlines your knowledge credentials and brings new business to your firm. Calculators & Evaluators is a comprehensive knowledge resource which will make sure your website works hard for your firm. Users can print and share results by email, export results to Excel and PDF and ask for an e-mail alert when there are updates. They can also comment on the Calculator/Evaluator and suggest a new Calculator/Evaluator. Holiday Entitlement, Inheritance Tax, Retirement, VAT, Savings, Stamp Duty, Redundancy, Borrowing Risks, Business Growth, Data Risk, Budgeting, Starting a Business, Employee Satisfaction and many many more. We’re very sure that you’ll gain real value from Calculators & Evaluators. That’s why we have the confidence to guarantee it. We’re so confident that you and your clients and customers will enjoy using the Calculators & Evaluators that we’re offering a 30 Day Money-Back Guarantee. If, within 30 days of the start of your subscription, you tell us that Calculators & Evaluators is not for you, we’ll refund your full subscription, with no questions asked. What’s more, if there’s a particular Calculator or Evaluator that you’re not happy with, please don’t hesitate to let us know. We guarantee that we will make it our absolute priority to ensure that the product matches our own high standards. There is no set-up fee for Calculators & Evaluators, just an easy, affordable monthly or annual payment option with a minimum 12 month subscription. We are extremely delighted with the scope and quality of the resources which far surpass any of the other providers of similar resources that we have come across during our many years in practice. All the resources help enormously in our aim to be positioned as a progressive and modern firm of accountants who provide many services above and beyond the normal compliance work. 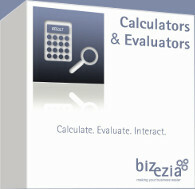 We have purchased all of Bizezia’s Calculators & Evaluators and find them to be fantastic value for money. I am very pleased with them and would recommend them to anyone who’s thinking of buying calculators to put on their website.